The Department of Community Development is the City agency which administers federal, State, and local funds to provide an array of unique community services and social programs. The department advocates and interacts with other city departments, local, state and federal agencies, public and private businesses to serve Kenner residents. Working in partnership with others, over the past year the department successfully met many unique needs such as providing capital improvements, educating our youth, housing the homeless, assisting fire victims, sponsoring food drives and food basket distributions for needy families during the holidays, awarding grants to youth to attend summer camps and providing financial assistance for first-time homebuyers. Specializing in providing help for needy Kenner families, communities and neighborhoods, grants and funding awards are designed to primarily serve neighborhoods and families of very low and low income households. In addition to funding received from the City, the department administers various State and federal grants from the U.S. Department of Housing and Urban Development (HUD), the Jefferson HOME Consortium, and the Louisiana Housing Corporation. The City of Kenner has received CDBG funds since the authorization of the program by Congress in 1974. Federal regulations require that no less than 70% of CDBG funds be used for activities that benefit persons of low and moderate income. Activities funded with CDBG dollars must meet eligibility criteria and comply with at least one of the three program National objectives. Through the HOME Investment Partnership program (HOME), HUD allocates funds by formula to eligible states and local governments. The purpose of the program is to expand the supply of decent, safe, sanitary, and affordable housing for low- and very low-income families. The City of Kenner is a member of the Jefferson Parish HOME consortium. HOME funding is awarded annually to the City of Kenner through the Jefferson Parish Community Development Department, the HOME consortium lead agency. The Emergency Solutions Grant replaced the Emergency Shelter Grant (ESG) program in 2011. ESG grant applications are submitted annually to the Louisiana, Housing Corporation. This is a competitive grant process. The department has been successful in achieving approval of their grant applications and the award of funds for several contiguous years. ESG grants provide for the operation of two existing emergency shelters, homeless prevention assistance such as rent and utility payments, emergency housing at hotels, short and long-term rental assistance for the homeless, counseling and other supportive services. The Department of Community Development also oversees the operation and service delivery systems of three (3) community resource centers. The resource centers are the Arthur P. Clay Center, 200 Decatur St., the Hispanic Resource Center, 4312 Florida Ave., and the Martin Luther King Resource Center, 1042 31st Street. Each center provides a varied group of services to youth, elderly, and non-English speaking citizens. Programs and services offered include free electronic income tax filing, housing & utility assistance, first-time homebuyers training classes, GED and English as a second language (ESL) classes in collaboration with the Jefferson Parish School System (JPSS), and an after-school tutoring and homework assistance program . Monthly, special guest speakers from law enforcement, health and social services and legal aid conduct informative workshops and helpful consumer information classes. The City of Kenner is a recipient of CDBG entitlement funds. We also receive HOME funds through our participation in the Jefferson Parish HOME Consortium. The following is a description of housing, community improvement and social services offered by the Department of Community Development. One of the primary objectives of the CDBG program is the preservation of existing housing stock. During the 2005-2006 fiscal year the City of Kenner housing programs were severely impacted by the effects of Hurricanes Katrina and Rita which devastated the metropolitan New Orleans and Gulf Coast areas. Sub- recipients and contractors alike were affected by this storm, resulting in a record low number of owner-occupied homes assisted. The loss of the Redwood Apartments complex greatly reduced the number of affordable housing units available within the City of Kenner. The HOME Program was created under Title II (the HOME Investment Partnerships Act) of the National Affordable Housing Act of 1990. The HOME Program permits the use of funds for housing rehabilitation and first-time home buyers' assistance. A local 25% match is required of the City toward all HOME funded projects. The City of Kenner is a member of the Jefferson Parish HOME consortium. HOME funding is awarded annually to the City of Kenner through the Jefferson Parish Community Development Department, the HOME consortium lead agency. 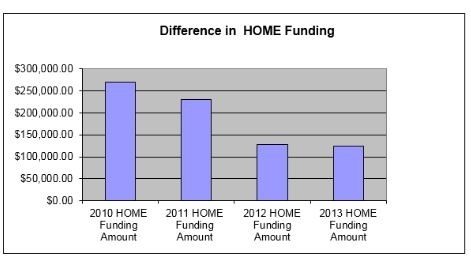 As shown below, the amount of funding awarded through the HOME program has been on a steady decline. In response to constant inquiry and the need for assistance by low income homeowners, the department implemented the Regular Owner-occupied Housing Rehab (ROOR) program in 2015. It had been closed for nearly 10 years. Housing assistance now includes the continuation of ROOR and the First time homebuyers assistance program. The First-time homebuyers assistance program is a homeownership Assistance Program established and administered by the City of Kenner Department of Community Development. It is designed to PROVIDE FINANCIAL ASSISTANCE to low, moderate, and median income households interested in purchasing THEIR FIRST HOME in the City of Kenner. The long-term outcome of this program is to increase the homeownership rates in the City of Kenner. Our program will bring homeownership closer to those families whose gross annual household incomes are at or below 80% of the New Orleans Area Median Income as defined by HUD (See table 2 below). Successful applicants will be eligible for a deferred payment loan, i.e. grant, up to $50,000.00 to be used toward down payment and closing cost assistance and to reduce their primary mortgage loan amounts. The grant is a soft second mortgage which will be forgiven according to specific grant terms and an affordability period established by HUD (see Table 1). For example: An applicant receiving $20,000.00 in program assistance would have an affordability period of 10 years. This means he/she would be required to live in the newly purchased home for ten (10) years in order for the loan to be fully forgiven. When the deferred payment loan, i.e. grant is forgiven, this negates the first-time homebuyer from repaying the money received. Used as investment or income producing property. 1. The property must be an existing or newly constructed single family residence located in the incorporated areas of the City of Kenner. 2. Be owner-occupied and serve as the applicant’s primary residence. 3. Be a single unit dwelling; no rental or investment property. 4. Meet local codes, Housing Quality Standards, and lead based paint standards. Property will be inspected by our Inspectors to insure it meets UPCS and City Code. 5. Be acceptable to the primary lender and insurer of the property. 6. Have a contracted sales price that does not exceed Program's determined affordability. The current maximum purchase price allowable is $180,000.00. Homes built before 1978 will not be eligible for program participation if a visual inspection determines deteriorated paint conditions (cracking, scaling, chipping, peeling, chalky, or loose) due to federal regulations under 24CFR, Part 35 “Lead Based Paint Requirements.” Such defective condition(s) if found will permanently disqualify the property from further consideration. 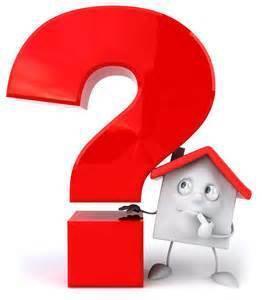 Who Is An Eligible First-time Homebuyer? Eligible participants include households that have not owned a home during the past three (3) years. Applicants must not have been disqualified from program participation during the last three (3) years. Applicants must be a U.S. Citizen or eligible Legal Alien (permanent residential status in the U.S.). The annual maximum allowable household income cannot exceed the following limits based on family size as established by HUD. For example: the annual income of a family of four cannot exceed $52,500. Program participants are required to complete a first-time homebuyers training course. The homebuyer education class explains the home-buying process to Prospective first-time home-buyers. Topics include: financial preparedness, renting vs. owning, how much house you can afford, working with professionals to find an ideal home, home maintenance and energy management, buyer assistance programs, mortgages, closing costs , homeowners insurance AND MORE. The overall objective of this program is to develop the education, knowledge and skills of the prospective first time homebuyer to allow them to make wise decisions when selecting and financing their first home. The Training provides information about the home buying process. Partnerships have been formed with HUD approved first-time homebuyer training providers to provide training to interested individuals and families. See link below for a listing of current approved training providers. HOW DO I GET STARTED???? 1. Attend a First-time Homebuyer and Financial Fitness Training Class and acquire a Certificate of completion. 2. Be creditworthy and able to qualify for a mortgage. The monthly payment required to service the mortgage amount cannot exceed 33% of Monthly Household Income. 3. Choose a lender and make an appointment to get your loan approved. 4. Choose a real estate agent to assist you with finding a home in a neighborhood of your choice. 5. Negotiate a purchase agreement with the seller after finding your dream home. 6. After the seller accepts your offer, provide a copy of your signed purchase agreement to the lender so you may begin processing your loan. 7. Complete the Application for the City of Kenner First-time Homebuyers Assistance Program and submit it with supporting documentation as listed on your application checklist to our office. Once the Application is accepted and reviewed by our office, a face-to-face appointment will be scheduled to discuss your application and supporting documents provided. 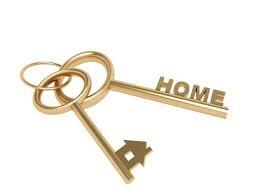 Click any of the links below to download and view documents for first time homebuyers. The Regular Owner Occupied Housing Rehabilitation program, referred to as the ROOR program is a program designed to provide assistance to homeowners who live in properties located within the incorporated limits of the City of Kenner in need of repairs. The ROOR program will assist homeowners to arrest deteriorating conditions currently found in their homes. Eligible low income homeowners can apply for this program and receive financial assistance for the repair and rehabilitation of their owner-occupied properties. The program goal is to bring single-family owner occupied housing units up to local code and HUD Universal Physical Condition Standards (UPCS). Work is performed by pre-qualified contractors and the City of Kenner consultants and staff are charged with overseeing and managing the rehabilitation project on behalf of the homeowner. Deferred payment loans, referred to as grants are awarded to pay for the repairs required to aid in the preservation of existing housing stock and the revitalization of low to moderate income neighborhoods. The maximum grant amount per household is $50,000.00. The Youth “After School Homework Assistance and Enrichment Program” has been sponsored by the City of Kenner for the past 12 years. This program is designed to assists students in grades 2 – 8 with educational services and leadership training. Homework assistance and mentoring is provided to improve the youths' learning ability, study habits, and successful outcomes at school. The program is offered directly after school during those hours when typically parents are not at home from work. It provides a safe haven for students during this time and keeps them off the streets. The goal of the “After School Homework Assistance and Enrichment Program” is to empower our youth to become effective and productive citizens at home, school, and in their communities. Students are provided assistance with homework, computer training, and life skills training, i.e. violence prevention, drug prevention, and exposure to alternative activities. Our program design fosters personal development to promote a sense of self-confidence in one's abilities and self-regulation of academic achievements while helping one's behavior. Certified teachers are employed to assist program participants in Reading, Math, English, Social studies and preparation for standardized testing. Daily, program participants are provided counseling and support to equip them with the necessary skills to reduce the risk for self-destructive behavior. The dangers of drug & alcohol use, character development, social skills, as well as ways to resist peer pressure are taught. The program is free for income eligible households and follows the Jefferson Parish Public School System calendar, i.e. when school is closed, the program will not be offered. Visit http://www.jppss.k12.la.us/ to view the school system calendar. The program is offered Monday - Thursday, 3:30 p.m. - 5:30 p.m., at 2 locations in the City of Kenner. Every Summer we offer grants for children in low-income households to attend a Theatre camp. In partnership with Leisure Services, a division of the Kenner Recreation Department, youth age 9 – 15 were enrolled in theatre camp. Grants are awarded to eligible households to pay for the weekly cost of camp. Students were introduced to the arts and taught acting, scenery, drama and more. The camp is offered in two, 2-week sessions in June and July. Our summer camp provide youth of low income households free attendance at the Kenner Recreation Department camp held at Butch Duhe’ or Woodlake gyms. This is a 10 week camp for kid’s age 3 – 12 years old. Grants are awarded to eligible households to pay for the weekly cost of camp, allowing parents to work and not suffer cost burdens as a result of needed child care for kids during the summer months when they are out of school. Activities include weekly visits to the pool for swimming, a weekly field trip, arts and crafts, theme fun days, and other activities to positively reinforce social skills and other successful outcomes. This activity is sponsored in collaboration with the City of Kenner Recreation Department. Financial assistance to low income households is made possible by a grant awarded to the City by the Louisiana Housing Corporation – The Emergency Solutions Grant. Eligible Residents can receive utility subsidies, rent payment assistance, counseling, and other supportive services in an effort to prevent homelessness. The applicant must provide proof of Kenner residency to receive rent and utility payment assistance. Homeowners and persons already on Section 8 (or other form of state or federal rental assistance) are not eligible for assistance. For rental assistance, the applicant must have a court ordered eviction notice that is signed by a judge and also have a current lease agreement in the applicant’s name. For utility assistance, the applicant must have a disconnect notice and lease agreement in their name. The amount of assistance may vary.